Santa Monica, California-based ZipRecruiter has raised $156 million in Series B funding this week, giving it a valuation of $1.5 billion. Wellington Management Company and IVP led the round, with participation by other existing investors. If you’re keeping score at home, ZipRecruiter has now raised $219 million in total, which includes a $63 million Series A financing also led by IVP in August 2014. The company said the financing will be used to fuel growth and further develop its AI-powered matching technology and highly rated mobile apps. Claiming to be the No. 1 mobile app is a bit subjective, keep in mind, as there really is no official ranking system in what’s still a fairly fragmented market, but it’s also challenging to prove such a statement wrong. It’s like telling a Pink Floyd fan that Zeppelin is the best band ever. In other words, the folks at Indeed might disagree. Anyway, the focus on AI and buzz terms like “smart recruiting” is wise if you’re trying to raise cash these days. In an environment currently under pressure from the likes of Google, Facebook, and LinkedIn, any site stuck in the past of online job postings-only is at risk of getting squashed. Throwing around AI also helps take attention off the necessity of funding the advertising machine, which I could argue is the only reason ZipRecruiter is able to deliver for its customers. The company says its algorithm learns what each employer is looking for, and provides a personalized, curated set of highly relevant candidates. 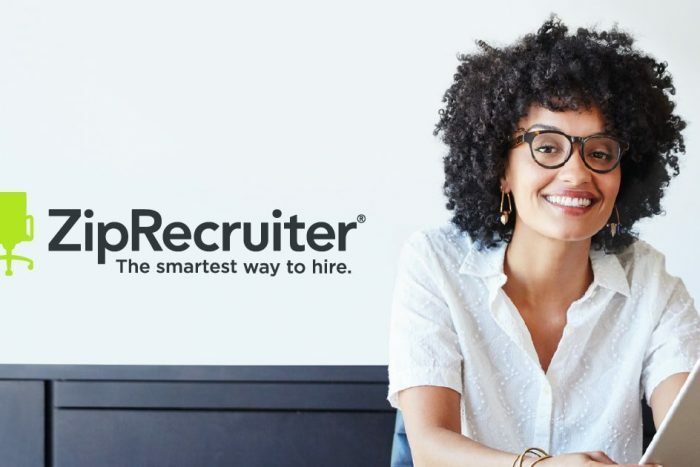 On the other side of the marketplace, ZipRecruiter says its technology matches job seekers with jobs based on factors beyond job titles, which introduces them to more industries and types of opportunities that they might be interested in. The technology has become so efficient that ZipRecruiter said 80 percent of employers who post a job online get a qualified candidate through the site within the first day — a time frame Siegel told Bloomberg he hopes to shorten. Questions about an impending IPO are sure to follow the new valuation. Keep in mind that Glassdoor, which sold for $1.2 billion this year, was rumored to go public this year as well. It sold in lieu of facing the public markets. Will ZipRecruiter follow? To answer that, you have to ponder who might acquire ZipRecruiter. Could Recruit Holdings, which already owns Indeed and Glassdoor, be a buyer? Facebook, which is already posting ZipRecruiter postings via Facebook Marketplace? Microsoft, which might think ZipRecruiter could be the final touch on a portfolio that already includes LinkedIn and GitHub? It’s fun to wonder, but no one really knows. The company has grown its employee base to nearly 1,000 from 150 in the past four years. In addition to its Los Angeles area headquarters, ZipRecruiter currently has offices in the U.S., UK, and Israel.